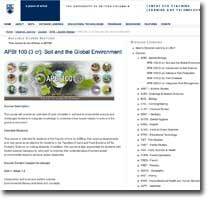 APBI 100 – Soil and the Global Environment is an online course exploring the linkages between global environmental issues and the soil beneath our feet. In this interactive course, you will engage in discussions exploring the roles of soil in food security, climate change, and societal decision making. APBI 100 is recommended for anyone wishing to improve understanding of current environmental issues to achieve global citizenship. A science background is not necessary.